"La Primitiva - Loteria Primitiva - from Loterias y Apuestas del Estado..."
Loteria Primitiva – La Primitiva – is a lottery game offered by one of the oldest lottery organizations in the world – Loteria Nacional – the Spanish National Lottery – which is run, of course, by the government of Spain. The company that runs all of the official Spanish Lottery games that you see offered on the internet and on the streets in Spain is Loterias del Estado – who's full title is Loterias y Apuestas del Estado. Loteria Nacional – also known as the Spanish National Lottery – has been in existence since the year 1763 and this means that it is one of the oldest and most respected lottery organizations that exists anywhere in the world. Out of all the lottery ticket sales generated by the Spanish Lottery – Loteria Nacional – 70% of funds paid in are put back into the Spanish Lotto prize pot, ie. they go right back to the players and this is the highest percentage from any world lottery game. 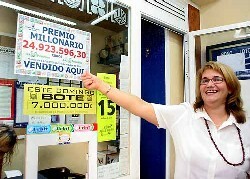 One of the principal goals of Loterias y Apuestas del Estado and the Loteria Nacional is to try and spread the wealth amongst as many of the Spanish people as possible and this is well achieved with large prizes being won and roughly 35 out of every 100 lottery tickets winning some kind of prize. 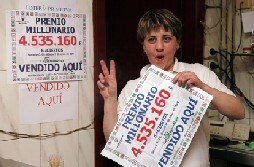 The ideology behind the various lottery games of the Loteria Nacional in Spain is based around sharing the highest number of lottery prizes between players and Loterias del Estado meets this aim with Spanish Lotto players having maximum chances of recouping their expenses at the same time as playing for some of the largest lottery prizes in the world. La Primitiva – Loteria Primitiva is the favourite lottery among the Spanish people and is the most popular of the weekly Spanish Lotto games. As its name implies La Primitiva (The Primitive One) is a very old lottery game and was first introduced way back in 1763 with the first draw taking place in Madrid on December 10th of that year. Way back then the Loteria Primitiva was a pick 5 numbers from a possible 90 game and this lasted until 1862. The Loteria Primitiva was reintroduced to the Spanish National Lottery portfolio in 1985 and is again one of the favourites drawn twice per week on Thursdays and Saturdays at 9.30pm CET. 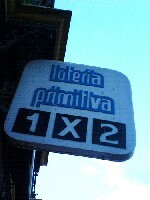 The Spanish Lottery – La Primitiva – Loteria Primitiva uses a single matrix of 6/49 meaning that when you play the Primitiva you need to select 6 numbers out of a pool of numbers ranging from 1 to 49. If you match all 6 of the main numbers you will be the lucky winner of a Loteria Primitiva jackpot prize. There are many other cash prizes to be won too with the Loteria Primitiva and in total there are 5 different ways in which you can win on this great and historical Spanish lotto game. Other prize categories are for matching 5 of the main numbers plus an additional number, 5 of the main numbers, 4 of the main numbers or even just 3 of the main numbers drawn. A facility is available when playing the Loteria Primitiva similar to the “Lucky Dip” that is used in the UK National Lottery or Europe’s EuroMillions – which means that you can choose to let the computer's or retailer's lotto number picker select your numbers for you using the "Quick Pick" option– saving you time. So, playing the Loteria Primitiva is easy…just select your own 6 numbers or let the computer or retailer generate them automatically for you using a random number generator. The cost per line on the Loteria Primitiva is the standard amount of €1.00. La Primitiva – Who Can Play? In the past – to play in any of the Spanish National Lottery games run by Loterias y Apuestas del Estado you needed to be a resident of Spain itself in order to take part. Nowadays you can play lottery online, however, with accredited and authorized lottery ticket sales companies such as TheLotter or WinTrillions – you can participate in the fun, no matter where in the world you live. This applies to the Loteria Primitiva and most of the Spanish Lotto games available and you can pick your Spanish Lottery numbers online and purchase your Loteria Primitiva tickets whether you live in Spain or anywhere else around the world. This is excellent news if you live outside of Spain but want to play in some of the world’s biggest lotteries and ensure your entry into the next draw or just simply wish to enjoy the convenience of being able to buy lottery tickets online. You must be 18 years of age to be eligible to buy lottery tickets for any of the Loteria Nacional games including La Primitiva. The Loteria Primitiva from the Spanish Lottery is drawn twice every week on Thursdays and Saturdays at 9.30pm CET. You can check all Spanish Lottery results and in particular the latest Loteria Primitiva Results in numerous ways to see if you have become one of the fortunate winners of this Spanish Lotto. For a start they will be published in various newspapers and broadcast on certain TV stations throughout Spain and will be displayed on the official Spanish Lottery website of Loterias y Apuestas del Estado – loteriasyapuestas.es. You cam also revisit Global Lottery Review at any time to see the latest Loteria Primitiva Results which will be shown shortly after each draw. The odds of winning the Loteria Primitiva are competitive when compared to many of the lotteries out around the world, especially considering how many people tend to participate in La Primitiva and other Spanish Lotto games. The odds of winning a La Primitiva jackpot are 1 in 13.98 million – for these odds you could be one of the lucky Loteria Primitiva jackpot winners by matching all 6 of the winning lottery numbers. For one of the prizes on the second level the odds come in at a better 1 in 2.33 million for matching 5 of the main winning numbers plus the Additional Nunber. The likelihood of winning a third tier prize comes in at 1 in 54,201 for correctly selecting 5 of the winning lotto numbers and for a prize on the fourth tier the lottery odds are reduced right down to just 1 in 1,032 for choosing 4 of the winning numers. For a prize on the fifth and final tier of the Loteria Primitiva the odds come in at just 1 in 57 for correctly matching just 3 of the winning Loteria Primitiva numbers. October 15th 2015 saw the all time record jackpot win for the Loteria Primitiva to date when a staggering € 100 MILLION was won by a lucky single ticket holder from Barcelona who played with the winning numbers of 01, 07, 21, 27, 38, 46 and the bonus numbers of 41 and 6. The 2nd biggest La Primitiva jackpot to have been produced so far was won on February 22nd 2014 when a massive top prize of € 71.28 MILLION was shared by 2 lucky winners after a 39 draw rollover streak – shattering its own previous record. The 3rd biggest Loteria Primitiva jackpot so far has been the huge € 66.6 MILLION which was won on August 3rd 2013 by a single ticket. The 4th highest La Primitiva jackpot to have been won so far has been the € 56 MILLION which was won by 2 lucky winning tickets on July 5th 2018. The 5th largest Loteria Primitiva jackpot to date was won on November 23rd 2017 when € 45.8 MILLION was won by a single ticket. € 24.92 MILLION was won in October 2005 by a lucky winner of the Loteria Primitiva in Malaga who picked the winning lottery numbers – 1, 13, 28, 32, 37 and 39 – which was a great way to celebrate this milestone in the history of this great Spanish Lottery. This win in October 2005 stood as the biggest jackpot so far until a huge Loteria Primitiva win of € 26 MILLION was recorded in 2007. This jackpot record was beaten again by the Loteria Primitiva in January 2013 when a top prize of € 32 MILLION was won which was then eclipsed by a € 33 MILLION win on November 22nd 2015. If you win the lottery with any of the games offered by Loterias y Apuestas del Estado including the Loteria Primitiva jackpot you will be your lottery winnings as tax free cash lump sums. There are various criteria depending upon where you buy lottery tickets – from a Loterias del Estado retail outlet on the streets in Spain or online from an authorized lottery ticket sales company such as TheLotter or WinTrillions. You will not need to be concerned about the size of your win or having to contact the company if you play lottery online as when you win the lottery your agent will make you winning payment direct to you if you buy lottery tickets online.